This play sportsbetting quiz at gamerisms will test what you know about sportsbook, sports and betting. Have you ever wanted to try your luck betting on a prizefighter, or raise the stakes on a friendly game of baseball? Well, before you start laying down your hard-earned cash on the next Mohammad Ali, try testing your wagering savvy on this sportsbetting quiz. 1) What does the sportsbetting term Ante Post mean? A. A wager placed on an event against another bettor. B. Betting that is placed 1 or more days before the date of the event. C. A bettor who is against wooden poles. 2) What is a Bottle in sportsbetting lingo? A. Lingo for a 2 to 1 odds bet. B. A plastic or glass flask that holds soda pop or beer. C. A term used to describe a nervous bettor. 3) What does the sportsbetting players' term Chalkeater mean? A. A bettor who wants to write on the blackboard. B. Slang term for a bettor with bad habits. C. Lingo for someone who bets only on favorites. 4) What does Goliath refer to with sportsbetting? A. Multiple bets that includes 247 bets for several events. B. Slang term for a tall Black Jack dealer. C. A bettor who places high wagers on the long shots of the game. 5) What is the sportsbetting definition of Pucks? A. Sports betting term for a game of Hockey. B. Another word for Poker Chips. C. Group of characters auditioning for a Shakespearian play. 6) What is Thick 'un in the sportsbetting world? A. Refers to the size of a wager made in a high stakes game. B. A phrase from the redneck dictionary meaning an adjective used to describe something such as "man, this burger they gave me sure is a thick 'un." C. A very large bet. 7) What does the players' term Wise Guy mean? A. term used for an obnoxious bettor. B. term for a skillful handicapper, or bettor. C. nickname of an alcoholic beverage served only in casinos. 8) What is a Bridge-Jumper in sportsbetting? A. A bettor who tries to combine one game with another. B. A bettor who only makes wagers on card games. C. A specialized handicapper for large show bets on favorites. 9) What does Odd-Even refer to? A. Names of the twins who operate the new craps table. B. Betting on whether total goals will result in an even or an odd number. C. The numbered groups of bettors that are divided for a certain sporting event. 10) What does the term Total Rounds mean? A. Wagering on the number of rounds that will take place in a boxing match. B. 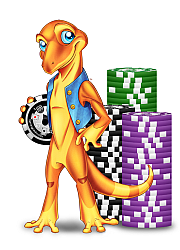 A term used for tallying up the number of tokens a bettor has. C. A type of cookies made from cereal. Answers to play sportsbetting quiz. Did your bets pay off? 1) B. Ante Post: betting that is placed 1 or more days before the date of the event. 2) A. Bottle: lingo for 2 to 1 odds bet. 3) C. Chalkeater: lingo for someone who bets only on favorites. 4) A. Goliath: multiple bets that includes 247 bets for several events. 5) A. Pucks: sportsbetting term for game of hockey. 6) C. Thick ‘un: a very large bet. 7) B. Wise Guy: term for a skillful handicapper or bettor. 8) C. Bridge-jumper: specialized handicapper for large show bets on favorites. 9) B. Odd-Even: betting on whether total goals will result in an even or odd number. 10) A. Total Rounds: wagering on the number of rounds that will take place in a boxing match. What does the term Hang Cheng refer to in sportsbetting? A. Asian lingo for Basketball Bet. B. Asian slang for Point Spread. C Asian jargon for Multiple Bets. B. Point Spread and that is your sportsbetting lesson in Asian slang. Along with this play sportsbetting quiz, there is a 3 part Sports Betting-Sportsbook Glossary at gamerisms.